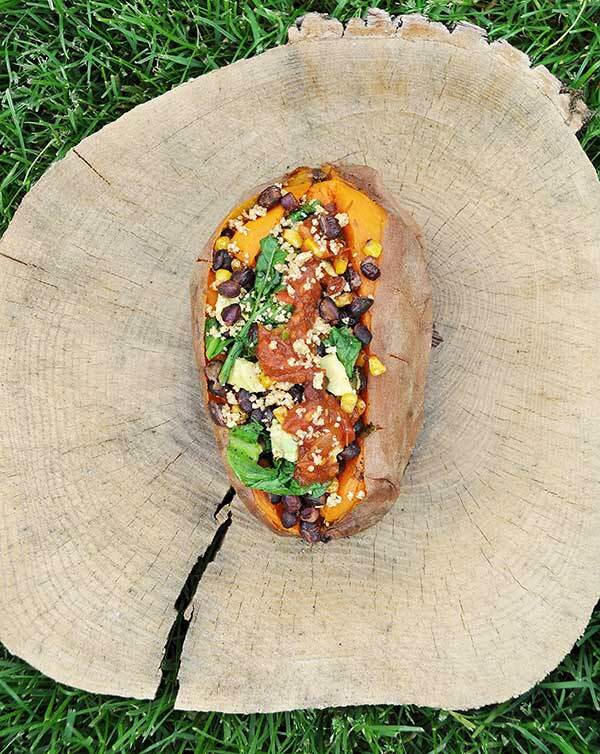 When you’re in the mood for Mexican but you don’t want the simple carbs from tortillas, make this spicy stuffed Mexican sweet potato. 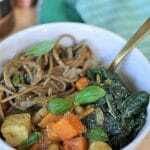 It’s delicious, healthy, and the perfect dinner for one. Of course, you can always make more if you need to feed a group. HOLY SWEET POTATO! 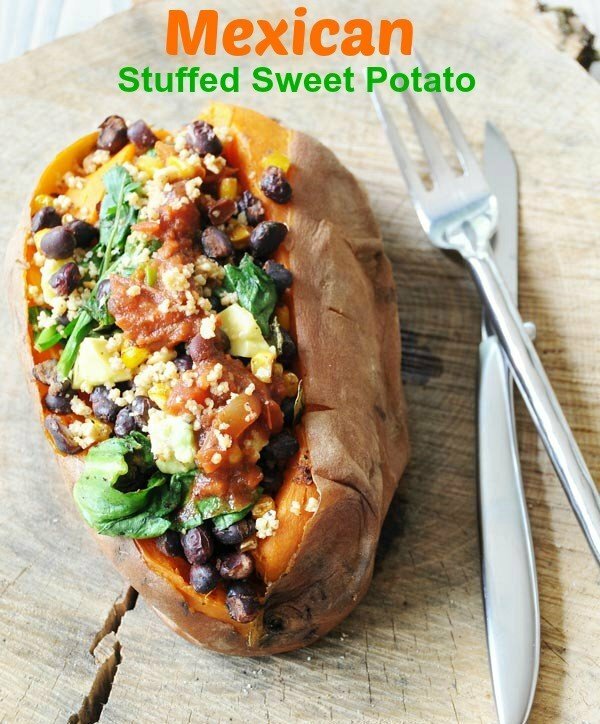 Yes, I just yelled that throughout the cyber world, and you would have too if you had been here to share this gorgeous single serving Mexican stuffed sweet potato with me. Since you weren’t – I’m sorry – let me try and paint a taste picture for you. Close your eyes and imagine….wait, don’t close your eyes, if you do you won’t be able to read the taste story. Okay, open your eyes and continue. Pull up a chair and check out the blazing orange sweet potato, stuffed with black beans, charred corn, bright green spinach, and cilantro that’s been kissed with chipotle chili powder, fancy paprika, cumin, sea salt, and pepper, and then sprinkled with a generous portion of crumbled cashew cheese and salsa. Have you ever seen anything quite as enticing as this? Now take a big whiff. Mmmmm, mmmmm, mmmmm! Can you smell the caramely sweetness of the sweet potato, and the earthy spiciness of the Mexican spices? How about the freshness of the cilantro, can you smell it? 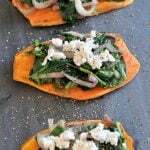 By now the vision and the aroma of that Mexican stuffed sweet potato are making your mouth water. Am I right? Finally, it’s time to take that first bite. Go ahead, get your fork in there and make sure that you scoop up a bit of everything. Don’t miss a thing! Now put it in your mouth and sigh. Are your eyes closed and rolling back in your head from the ecstasy of this magic potato? Who needs artificial stimulants when there’s food like this to make you happy? Let food be thy medicine and thy drug; only if it’s healthy though, otherwise no es bueno. Now that you’re craving a healthy singe serving Mexican stuffed sweet potato like a sugar addict craves diet Coke – have you ever noticed how people who eat a crap ton of junk food always drink diet soda? – it’s time to talk about putting this bad girl together. For some reason all of the sweet potatoes in my neck of the woods are ginormous. This potato is like two pounds all on its own. Griffin and I split it for lunch and I was totally satisfied. He wasn’t, but then again, his stomach is a bottomless pit. He kills me, the more he eats the bigger his six pack and shoulder girth gets. How does that happen? But I digress. Back to the sweet potato. Putting this together is easy! Scrub the potato, pierce it with a fork a couple of times, wrap it in foil, and pop it in the oven for an hour. Now, go and catch up on Southern Charm, Real Housewives (Bravo is my guilty pleasure), or the Bachelorette. Mindless fun. If that’s not your thing, get a quick work out in. I can multi-task so I would catch up on a show while working out. Bam! Once the potato is done—if you can pinch it and it’s soft, it’s done—take it out of the oven and let it sit in the foil while you prepare the filling. The cashew cheese crumbles are super easy and fast to make. 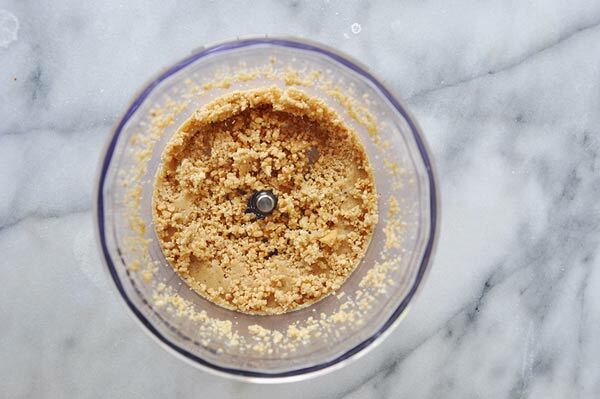 All you need to do is add the cashews a tiny bit of olive oil, lemon juice, and sea salt to a food processor and process until you get crumbles. Make that first. 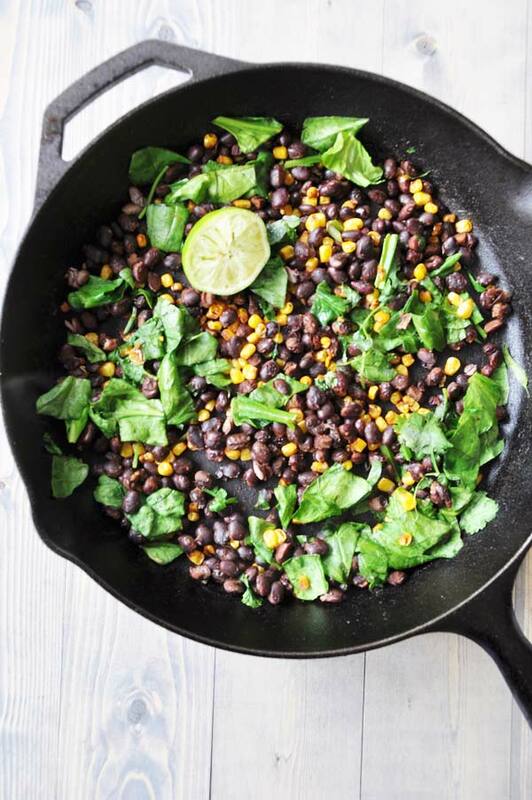 To make the charred corn and beans you’ll want to use an iron skillet, this is really the best type of pan for cooking. In my opinion anyway. Get the skillet really hot, add a tiny bit of avocado oil (this type of oil has a high smoke point) and put the kernels in. Toss them around until they begin to brown, then turn the heat down and add the beans and spices. Add the spinach and the cilantro and cook until they begin to wilt and turn a deep green. Now turn off the flame and remove the pan from the heat. Peel the foil off of the sweet potato, slice it down the center and open it up, fill it with the spicy filling, top it with the cheese, salsa, and fresh cilantro, and enjoy. If you don’t have the time to bake the potato in the evening you can always bake it up to a day ahead of time if you take it out of the oven, remove the foil, and put it directly on a plate and into the refrigerator. You don’t want to let a potato that’s wrapped in foil sit out until it’s cool because the moisture can create bacteria quickly, and I don’t want you to get sick. 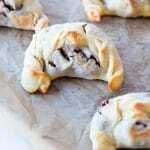 Re-heat it in a microwave for two minute increments, or in the oven until the center is hot. If you’re going to a party that won’t have vegan food options for you this is a great dish to take with you because it’s so portable and filling. It’s also great for a picnic. 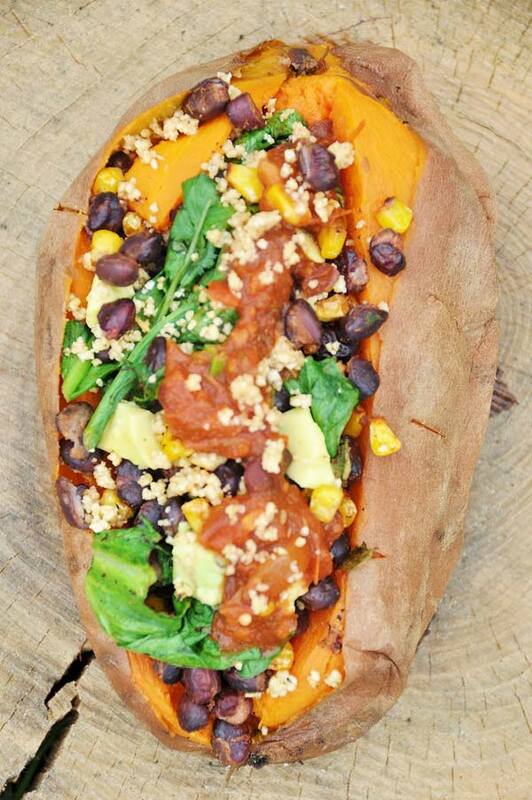 A spicy and hearty stuffed sweet potato filled with healthy black beans, corn, spinach, and cashew cheese. 1 large sweet potato pierced with a fork several times, and wrapped tightly in foil. 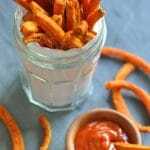 Bake the sweet potato for one hour or until it’s soft to the touch when pinched. Remove from the oven and set aside. Leave the foil on. In a small food processor process the ingredients for the cashew cheese crumbles until the mixture looks like pebbles. Take the foil off of the potato and put on a plate. Slice down the middle and separate. Fill with the corn and bean mixture and top with the cashew cheese crumbles and salsa. Sprinkle with some fresh cilantro if desired. Note: If you don’t have the time to bake the potato in the evening you can always bake it up to a day ahead of time if you take it out of the oven, remove the foil, and put it directly on a plate and into the refrigerator. You don’t want to let a potato that’s wrapped in foil sit out until it’s cool because the moisture can create bacteria quickly, and I don’t want you to get sick. 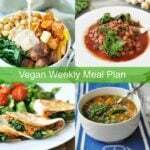 Re-heat it in a microwave for two minute increments, or in the oven until the center is hot. To store a filled potato, wrap in foil and refrigerate for one to two days. Reheat until the center of the potato is hot.